Vivah - A Journey From Engagement To Marriage ... (Hindi: विवाह, Urdu: وواہ, English: Marriage) is a 2006 Bollywood romantic drama film. The film is written and directed by Sooraj R. Barjatya and stars Shahid Kapoor and Amrita Rao. 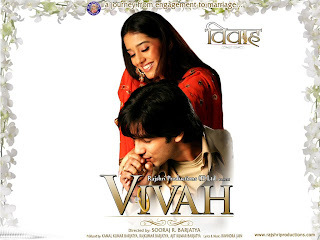 Vivah is the story of Prem (Shahid Kapoor), an upper-class business manager, and Poonam (Amrita Rao), a middle class college student's wedding. It is set in Delhi and also in the fictional town of Madhupur, located near Delhi in Uttar Pradesh. 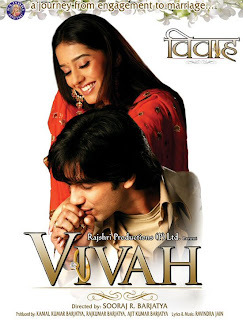 Vivah was released on November 10, 2006 across India and received a Telugu dub as Parinayam. Sooraj R. Barjatya noted that the story of Vivah is based upon a newspaper article his father read sixteen years ago, in 1988.Like in all of Sooraj R. Barjatya's previous movies, the male lead is, once again, called Prem. Filming took place during the first months of 2006 - in May 2006, eighty five percent of the filming was done.The jewellery Poonam receives from Prem during the movie was created by Indian jeweller D'damas, while Amrita Rao's costumes were created by Indian designer Anna Singh and Shahid Kapoor's clothes were created by Shabina Khan. Both designer were part of a crew of 166 people. Filming took place in Mathura, as well as in Almora, Nainital, Delhi, Mumbai, the Filmcity in Goregaon, as well as Madh Island, Lonavla, Ghaziabad, Faridabad, Moradabad and Ranikhet. Poonam "Bitto" (Amrita Rao). A young woman from Madhupur with very traditional values. She is an orphan and lives with her uncle, aunt and cousin Rajni and gets engaged to Prem. Mr. Harischandra (Anupam Kher). Prem's and Sunil's father, a kind man and head of his own enterprise. Bound to traditional values and very loving to his family, he urges Prem to get engaged to Poonam. Krishnakant "Chacha" (Alok Nath). Rajni's father and Poonam's uncle. He loves his niece very much and only hesitantly agrees to let her leave his house. Sunil, Prem's brother (Samir Soni). Prem's brother and Mr. Harishchandra's son. He works at his father's enterprise and is always seen reading newspapers. Though sometimes seemingly cross, he very much loves his family. Bhavna, Sunil's wife (Lata Sabharwal). Sunil's wife. She is a warm, kind and humorous person and takes care of her husband's and father-in-law's household. She arranges the meetings between Prem and Poonam. She has a son called Rahul. Rajni "Choti" (Amrita Prakash). Krishna Kant's and Rama's daughter, and Poonam's cousin. Humorous and a little bit mischievous, she does everything for her cousin and Prem to meet and fall in love with each other. She lacks in beauty compared to Poonam. Rahul (Ameya Pandya). Bhavna's and Sunil's son. A lively, fun, little, mischievous young boy. Doctor Rashid Khan (Mohnish Behl in a guest appearance). The doctor Poonam gets treated by. An able doctor and very concerned human.